... this study abroad experience opened my eyes to the applicability of the content and lessons taught within both the QUEST honors program and the Clark School. The following blog was written and submitted by Andrew Jones, a senior majoring in aerospace engineering. Over the 2017–18 winter break, the Quality Enhancement Systems and Teams (QUEST) honors program took 20 students to Spain to study how Spanish culture influences design and innovation. QUEST is a multidisciplinary, hands-on learning program that focuses on quality management, systems thinking, and process improvement. The program offers a variety of learning experiences, ranging from semester-long projects with company sponsors to study abroad experiences, such as the QUEST2Spain trip I went on. While in Barcelona and Madrid, we had the opportunity to participate in various workshops alongside undergraduate and graduate students pursuing degrees in the visual arts. 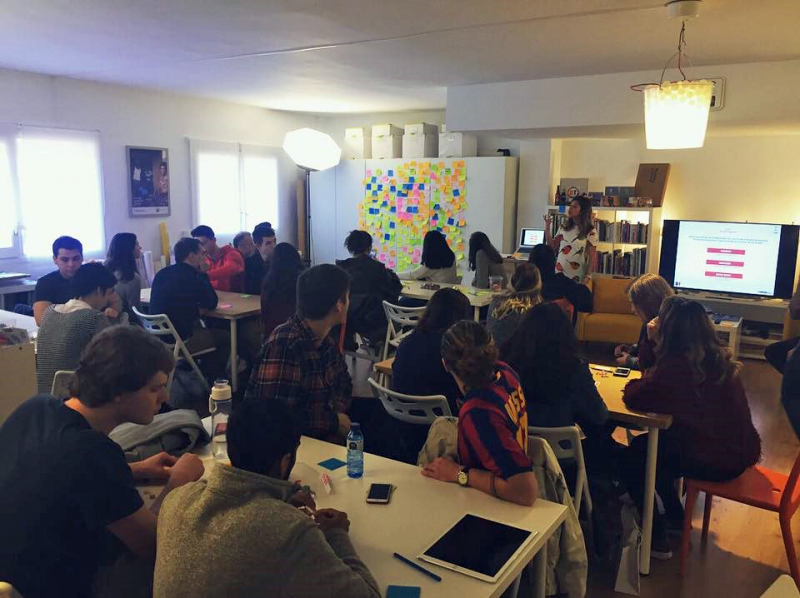 In Barcelona, we took part in a design thinking activity with master’s students from a nearby university. Each student started by telling us about what they were working on for their year-long projects. One student explained his project with BoxBarcelona, a fitness studio sponsored by Nike, and how his team was seeking opportunities to reach out to target audiences to attend their facility. Seeing how they applied these design thinking skills, like the ones taught in the QUEST program, broadened my views to the diversity of problems this methodology can tackle. During the activity, the workshop leaders took us through the five stages of design thinking, working in teams on different ideas and culminating with each team presenting what they created. Our team focused on synthesizing Bitcoin and the functionality of Venmo into one app, in which people could more easily trade Bitcoin and other cryptocurrencies. We had a similar experience in Madrid during one of our visits to the Istituto Europeo di Design (IED). Throughout the course, we had been learning about artists such as Antonio Gaudi and how they drew inspiration from nature into their works. Similarly, this workshop at IED started out with a lesson on biomimicry, or the designs of systems and machines that model biological processes or manifestations. We then had to create something that would help with disaster relief, drawing inspiration from snails that were handed out at every table. At the A. James Clark School of Engineering, I have taken courses in statics, mechanics of materials, and aerospace structures, which are all courses that investigate the physics of already existing structures and require a small project that leveraged what we learned. However, the opportunity to not only think outside the box but also draw inspiration from what already exists in nature allowed me to understand this parallel in the ways human can handle problem solving. This insight, in conjunction with working with IED students, helped our team in creating an autonomous vehicle, which used multidirectional sensing probes and a light-weight, sturdy spiral shell to transport goods to people in need. The opportunity to participate in this study abroad experience opened my eyes to the applicability of the content and lessons taught within both the QUEST honors program and the Clark School. In addition, it gave me insight and inspiration to new ways to approach problems—a useful skillset to any engineer in their profession.